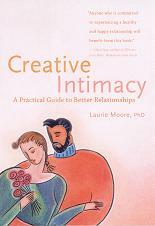 "Creative Intimacy offers a new and fresh perspective for couples who are ready to improve their communication skills. This book offers offers couples a way to make their relationships happier and more loving." "She's the millennium Guru on relationships. Our relationship had sunk to the depth of despair. Thanks to Dr. Laurie Moore we are now sharing light hearted happiness and pleasure instead." "All I can say is wow! Dr. Laurie Moore's perspective contributed to my marriage in ways I didn't expect! Dr. Laurie Moore is uniquely talented." "Dr. Laurie Moore knows how to access positive solutions in her own life and makes it easy for the rest of us to do the same. Creative intimacy is a convenient road map for those who desire more harmony in their relationships."